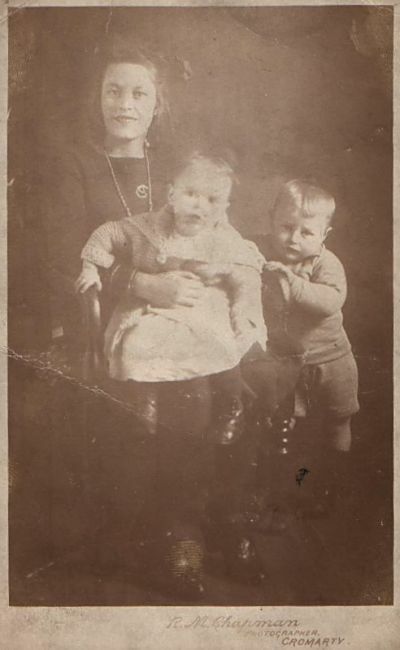 Alan says "this is a picture of my grandmother Elsie Hogg with her sister on her lap, Jean Hogg and her brother Donald Hogg from 76 Big Vennel. The children of William Hogg and Christina Hogg nee Watson." Mrs Hogg and her sister Bella lived in No.67 Big Vennel and my family moved there in 1940 or 41 following my father who was in the Army guarding the entrance to Cromarty and Moray Firths. He had the number 67 on his papers and we knew it as 67. We lived there for over a year. Our family name is Palmer. We moved to Duke St staying with the sisters Miss Paul. Came across this by accident and wondered whether there is a connection between my great Aunt Jean and Uncle Jim, they lived at 99 Shore Road, Cromarty and as I understand it Jeans Mother was Helen Hogg, there is some confusion as to whether Aunt Jean and Uncle Jim were leading a "moral life" and could have been talked about locally. My Grandmothers name was Christina (sister to Jean) and married and went to live in Reading, Berks.